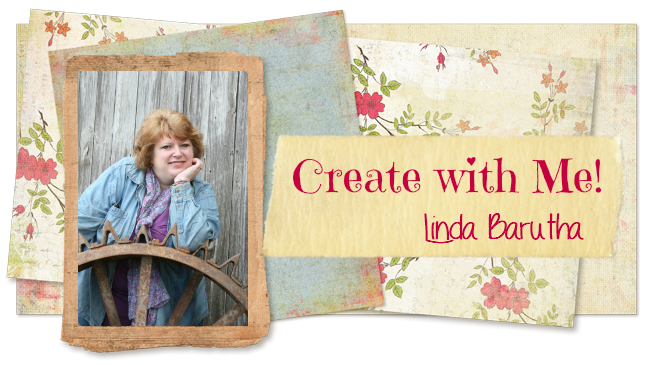 I'm Karen and today I'm here to share my scrapbook layout using a Linnie Blooms Mini File Folder. 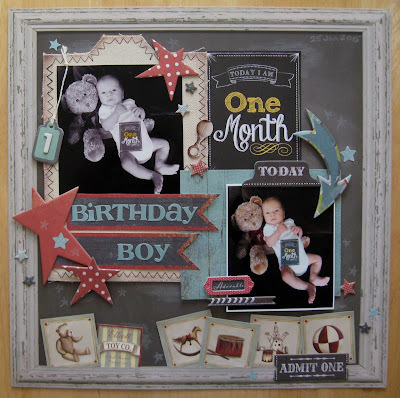 I used the file folder as a matting to add softness to my nephew Colin's one month old birthday layout. I chose a chalkboard background and vintage toy embellishments to bring it all together. Some of my most favorite layouts have been ones with lots of layers and different textures. I think the distressed canvas perfectly compliments the vintage feel of this layout. I love those little frayed edges and the zig zag stitching is done for you. It was sew easy!!! 1. Lightly dust the edge of the Canvas Mini File Folder with brown and grey chalk to distress the fabric and give it an aged appearance. 2. Matte one photo with paper and attach the other to the file folder. 3. Assemble the title on 2 flags and use twine to hang a small tag from the corner of one of the photos. 4. Use a craft knife to slice the edge of the chalkboard/frame to tuck some accents along the bottom of the frame. 5. Embellish the layout with chipboard stars. 6. Add faux chalk doodles and dust smudges to the background with a white pencil. Visit the Linnie Blooms Shop to see their wonderful range of canvas products. Drop by and visit me sometime at Art & Soul.